In this blog we continue to find out the truth about anesthesia and debunk the wrong ideas pet owners may have. Check here for a look back at a part 1. In part 2, I discuss whether a pet can be too young, too old or too sick to undergo anesthesia. Young patients do present the veterinarian and their staff with a bit more of a challenge compared to adults. Pediatric pets are typically smaller and more sensitive, so they need anesthesia techniques and protocols to be tailored for them. For example, because of their (usually) smaller size, they lose heat quicker so their temperature has to be closely monitored and specific techniques should be used to keep them warm. Young patients also have fewer energy reserves than adults. This is the reason why your veterinarian may recommend a small meal the morning of anesthesia, whereas adults should be completely fasted overnight. Youth is not a reason to avoid anesthesia; however, your veterinarian should make sure pediatric patients are kept warm, vital signs are closely monitored and anesthetic drugs are chosen wisely. This is another big misconception. Old age is basically never a reason not to perform a surgical or medical procedure. Sure, it may be an issue in the owner’s mind, but rarely in the veterinarian’s opinion. 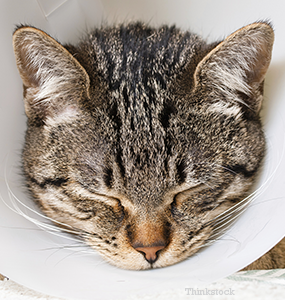 Thanks to the advances in veterinary medicine, pets enjoy longer lives now than ever before. Although, like humans, As pets age their bodies change—resulting in a slower metabolism, greater sensitivity to medications and slower healing time. Geriatric patients often do need some additional pre-anesthesia screening including blood work, chest radiographs (to ensure their lungs are free of disease or cancer) and an EKG to confirm they do not have any major heart problems. Once their overall health status has been assessed, the veterinarian can decide on any pre-anesthesia supportive care or medications. Anesthesia drugs should then be chosen to minimize side-effects for geriatric pets based on their specific condition. My philosophy is simple: age is not a disease! Cancer is a disease, a uterus full of pus (pyometra) is a disease, and a gallbladder about to burst is a disease; but age by itself is not. Certainly some patients are so sick that anesthesia should be postponed until they are more stable, if at all possible. Stabilizing a patient may mean administering IV fluids or specific drugs. Once they are more stable, anesthesia can be performed. Your veterinarian will carefully evaluate your pet’s blood work and physical health status to determine if he is stable enough to be anesthetized, or what stabilization treatments are needed first. In some extreme or emergency situations, we may have no choice. A very sick patient may need to undergo anesthesia immediately to have the surgery that will make him feel better or save his life. For example, if a dog “bloats” or presents with a hugely distended or twisted stomach, he will need surgery as soon as possible. I will, however, give large volumes of IV fluids before anesthesia starts. As you can see, young age, old age and sickness are not valid reasons to avoid anesthesia. They are challenges that can be overcome with proper medical care. If your pet needs a life-saving procedure we must stabilize the patient as quickly as possible, then do everything we can to perform surgery while keeping anesthesia safe.